This graph shows a plot of a single channel of the correlator output as a function of time, when observing Mars. In this image we see a screenshot of the full correlator output for a single one-second integration. The top two windows are the spectral shapes of the signals from the two individual antennas. 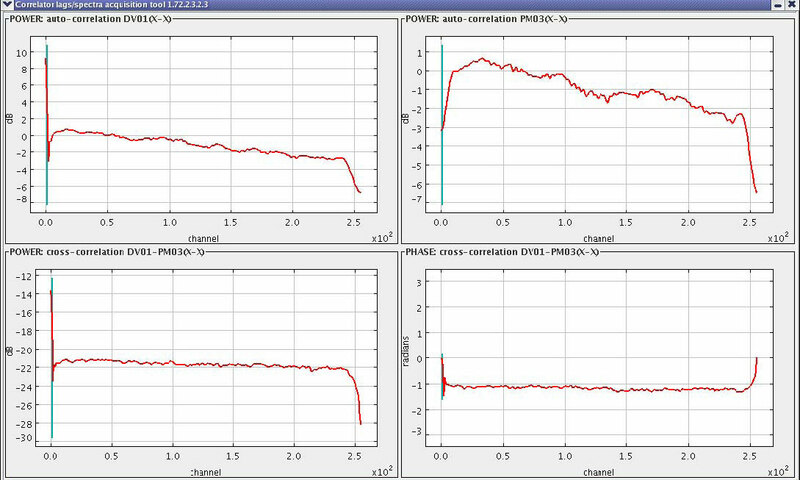 The bottom ones are the phase (right) and cross-correlated power (left), which is a little less than one percent of the total. 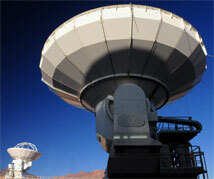 The two antennas used in this first and successful test, provided by ALMA's North American and East Asian partners. The Atacama Large Millimeter/submillimeter Array (ALMA), an immense international telescope project under construction in northern Chile, reached a major milestone on April 30, when two ALMA antennas were linked together as an integrated system to observe an astronomical object for the first time. The milestone achievement, technically termed "First Fringes," came at ALMA’s Operations Support Facility, 9,500 feet above sea level. Faint radio waves emitted by the planet Mars were collected by the two 12-meter diameter ALMA antennas, then processed by state-of-the-art electronics to turn the two antennas into a single, high-resolution telescope system, called an interferometer. Such pairs of antennas are the basic building blocks of imaging systems that enable radio telescopes to deliver pictures that approach or even exceed the resolving power of visible light telescopes. In such a system, each antenna is combined electronically with every other antenna to form a multitude of antenna pairs. Each pair contributes unique information that is used to build a highly-detailed image of the astronomical object under observation. When completed early in the next decade, ALMA’s 66 antennas will provide over a thousand such antenna pairings, with distances between antennas exceeding ten miles. This will enable ALMA to see with a sharpness surpassing that of the best space telescopes. 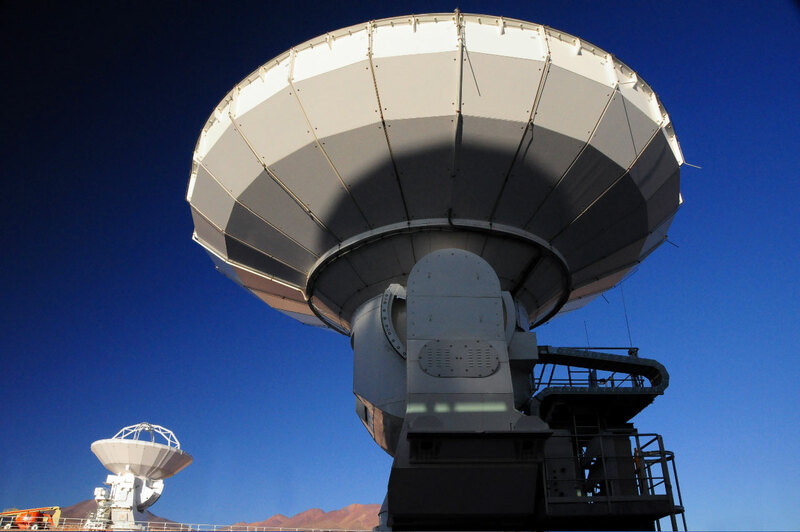 The antennas will operate at an altitude of 16,500 feet, high above the OSF, in one of the best locations on Earth for millimeter-wavelength astronomy, the Chajnantor Plateau in Chile’s Atacama Desert. Last week’s successful Mars observation was conducted at an observing frequency of 104.2 GHz. Astronomers measured the distinctive varying “fringes” detected by the interferometer as the planet moved across the sky. “This can only be achieved with the perfect synchronization of the antennas and the electronic equipment: a precision much better than one millionth of a millionth of a second between equipment located many kilometers apart. The extreme environment where the ALMA observatory is located, with its strong winds, high altitude, and wide range of temperatures, just adds to the complexity of the observatory and to the fascinating engineering challenges we face,” commented Richard Murowinski, ALMA Project Engineer at the Joint ALMA Observatory (JAO) in Chile. ALMA will provide astronomers with the world's most advanced tool for exploring the Universe at millimeter and submillimeter wavelengths. It will detect fainter objects and be able to produce much higher-quality images at these wavelengths than any previous telescope system. Scientists are eager to use this transformational capability to study stars and galaxies that formed in the early Universe, to learn long-sought details about how stars are born, and to trace the motion of gas and dust as it whirls toward the surface of newly-formed stars and planets. With ALMA, astronomers will study the cool Universe: the molecular gas and dust that constitute the building blocks of stars, planetary systems, galaxies, and of life itself, providing new and necessary information on the creation of stars and planets. It will also reveal distant galaxies from the primal universe that we will see as they were more than ten billion years ago, representing not only an important observation instrument for scientists, but also a new cosmic vision for humanity.